The second article of a pair with Mapping Archaeology While Mapping an Empire: Using Historical Maps to Reconstruct Ancient Settlement Landscapes in Modern India and Pakistan. This uses the theoretical techniques developed there with a real world example, the devastating Indus flood of 1909 that led to the complete resettlement of the 400 year old city of Dera Ghazi Khan on the west bank of the Indus River. What is so surprising is that barely a hundred years after the flood, the original site is not discernible through remote sensing, so completely has it been submerged by agriculture. The authors use this to suggest that countless ancient sites may remain buried under a shifting landscape in the Indus (and by extension, other similar river basins): "Large areas of Punjab appear to have been largely unpopulated in terms of archaeological data, at least for the protohistoric periods, but also to some extend the historic periods. Our data underlines that five thousand years of very active river geomorphology could have had an important influence on the number of sites that have been available to document using our current recording methods in combination with the patterns of the known site distributions in Punjab" (p. 17). Indeed, what they aptly describe as "the concealing of a relatively large settlement in a short period of time" has many implications for how we think of Indus and other ancient cities and settlement patterns, the way some sites were abandoned, and new ones, like Mohenjo-daro and, over 2,000 years later, DG Khan, laid out on a grid pattern with defenses against future floods. 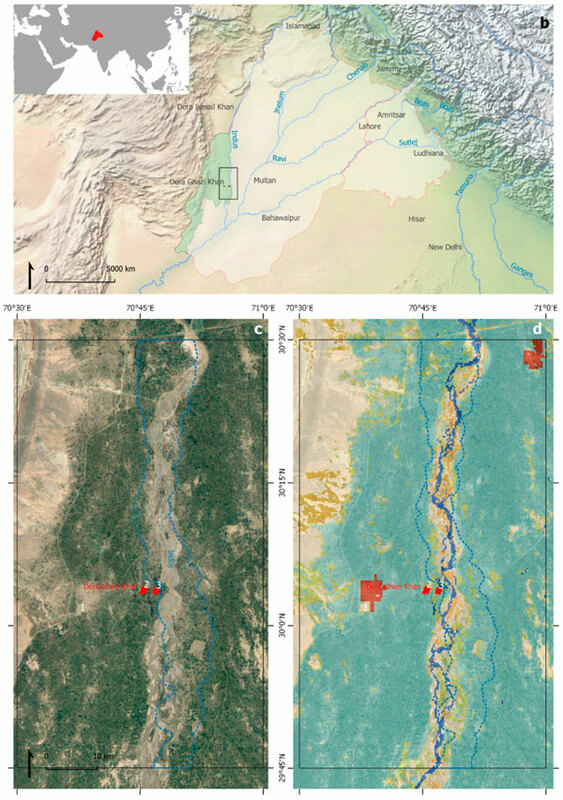 "The response of DG Khan inhabitants makes us wonder to what point construction techniques and habitation patterns and practices in the past were influenced by similar river morphodynamics. When studying past settlement in similar landscapes it is, therefore, worth considering a type of habitation characterised by a high degree of mobility" (p. 18). This novel and insightful paper is another example of modern scientific techniques being combined with historical data, even from another epoch, being used to ask great questions and open new fields of inquiry. Clearly the ancient Indus period, and times before and after, were characterized by shifting rivers and evolving terrain, and people must have adapted lifestyles and social and political strategies to cope with them. Directed, well-organized settlement patterns may have been part of civilizational evolution at certain points in time, at least when state or regional structures were strong enough. Just as archaeology of the period was getting complicated enough, a whole new dimension is brought to bear on our understanding of history, using lessons observed based on the physical nature of the same region thousands of years later. Image: Situation and context of the AOI: (a,b) DG Khan district in the context of the moderns Punjab Province (Pakistan) and Punjab State (India); (c) actual aspect of the AOI and situation of the DG Khan modern city (1), historical town (3) and nineteenth century British cantonment (2). The dotted line represents the active floodplain of the Indus as it was in 1907; (d) actual land-cover classification (GLOBCOVER V. 2.3, 2009) show the area occupied almost entirely by irrigated croplands, except in the riverbed and mountain slopes.